Photo courtesy of The Cause Collective. The Truth Booth on the Peristyle of Cranbrook Art Museum, the first stop on its 2016 tour of Metro Detroit and Flint. The Truth Booth at the Rivard Plaza on the Detroit Riverwalk, a stop on its 2016 tour of Metro Detroit and Flint. The Truth Booth in Banglatown, a stop on its 2016 tour of Metro Detroit and Flint. 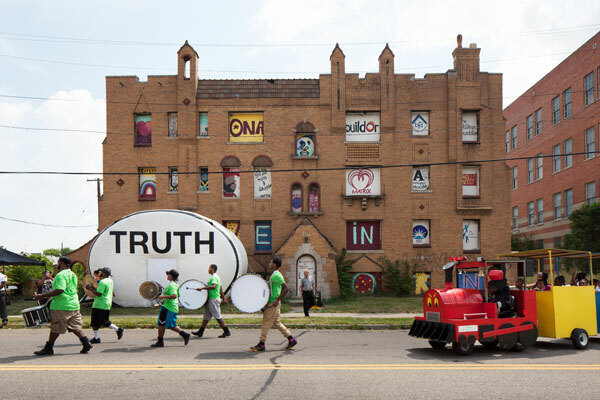 The Truth Booth at the "For Love of Osborn" parade in the Osborn neighborhood of Detroit, a stop on its 2016 tour of Metro Detroit and Flint. The Truth Booth at the Heidlelberg Project, a stop on its 2016 tour of Metro Detroit and Flint. The Truth Booth at the Detroit Institute of Art, a stop on its 2016 tour of Metro Detroit and Flint. The Truth Booth at the Hispanic Technology & Community Center of Greater Flint, a stop on its 2016 tour of Metro Detroit and Flint. 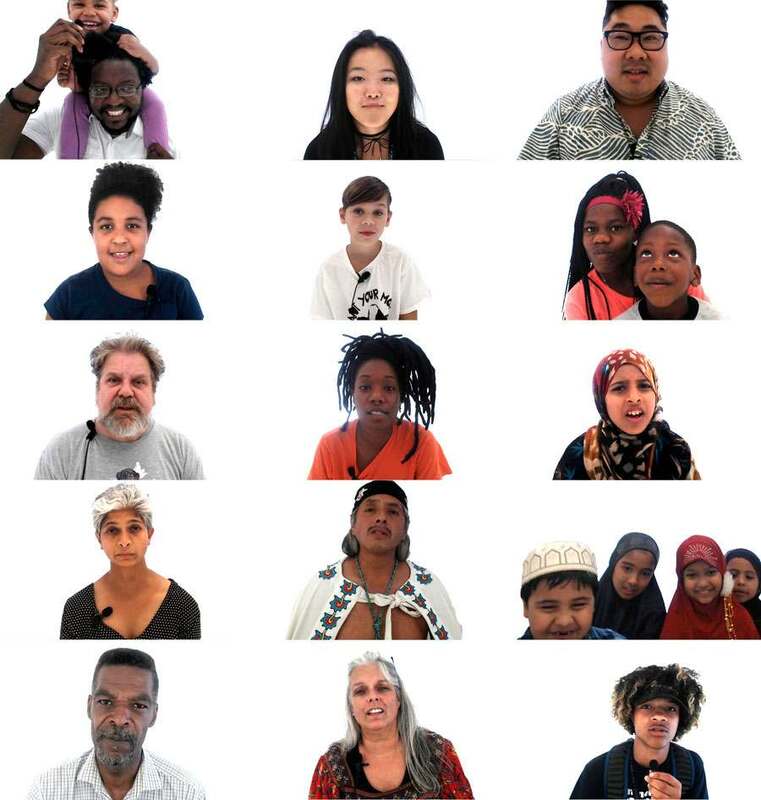 This exhibition is the culmination of a two-week project involving The Truth Booth, a portable, inflatable video recording studio in the shape of a giant speech bubble developed by The Cause Collective. The booth toured eleven locations in Metro Detroit and Flint, Michigan, in the summer of 2016. At each location, participants had up to two minutes to record a statement starting with the words, “The Truth Is…”. The recorded results of this project, numbering nearly one thousand, have been used to create an ambitious 60-foot-wide video installation. Accompanying the video will be documentation of the regional Truth Booth tour by photographer Corine Vermeulen (a graduate of Cranbrook Academy of Art) and video by Detroit-based filmmakers The Right Brothers. The exhibition will also include a participatory room by The Cause Collective allowing museum visitors to write their own responses to the question “The Truth Is…” on helium-filled speech-bubble balloons. The Truth Booth is an opportunity to create conversations among residents who inhabit the same geographic region, and expand our collective understanding of how the city defines what is real, authentic, valuable or true. Cranbrook Art Museum will host public screenings of selections from the exhibition in a variety of locations in Detroit and Flint. Dates, times and locations will be posted here as soon as they are confirmed. The Truth Booth is a project by The Cause Collective artists Ryan Alexiev, Jim Ricks, Will Sylvester and Hank Willis Thomas. The tour and exhibition is curated by Laura Mott, Curator of Contemporary Art and Design and organized by Cranbrook Art Museum. The Presenting Sponsor is the Knight Foundation. Leadership sponsors include The Applebaum Family Compass Fund, the National Endowment for the Arts, the Masco Foundation, and Maryanne Mott, who is providing support for The Truth Booth in Flint. Additional support provided by Emily Camiener and Marc Schwartz, Lynn and Bharat Gandhi and Lila Silverman. Community partners include the Arab-American National Museum, the Clark Park Coalition, Detroit Institute of Arts, Detroit RiverFront Conservancy, the Heidelberg Project, the Mott-Warsh Collection, the Osborn Neighborhood Alliance, Power House Productions, and the Sidewalk Festival for the Performing Arts.